Power kiting is an easily accessible sport that is appropriate for all age groups. They are small to pack down and extremely durable which makes them ideal for recreational use with kids and families as an alternative to sparred delta kites. 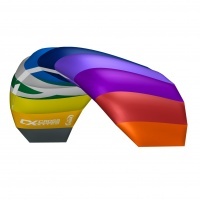 We stock a wide variety of powerkites from simple beginner 2 line to more advanced 4 line kites. Whether you want to skud along the beach, blast around in a buggy or boost with a landboard we will have the suitable gear available. We fly ourselves and test every kite before it goes onto the website so give us a call with any specific questions you may have. HQ's Symphony Beach powerkite is a very compact 2 line entry level foil kite for children and parents to fly together. 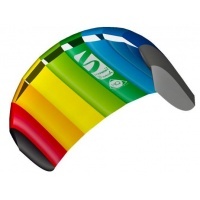 More durable than a traditional stunt kite. Cross Air is a fantastic 2 line kite for a beginner kite enthusiast who wants to fly recreationally. The kite is easy to steer and very stable. Suitable for all ages. Looking for a bit of fun down the beach on a sunny and windy day? 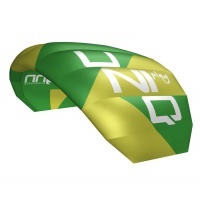 The Uniq Play is just what you'll need to really make the most of it! The Hype (previously Vibe) by Peter Lynn is a high performance quality built two line power kite. Great for all the family on the beach or in the park and from 1.3m to 2.6m it is challenging to fly and packs a punch. The Hype trainer is a kitesurf style trainer built from the popular Hype kite from Peter Lynn. A two line bar with safety strap is perfect to get out and practice flying with the family. The Ozone Ignition V2 is an extremely versatile and well built kitesurf trainer kite. Learn to power kite with a bar ready for your first kitesurfing lessons.